I get the theory of clustering in shops when it comes to things like paint supplies or clothing. Shops where you can go from one to the next looking for a bargain or an item that’s only in stock in one of the stores. However, I don’t really understand why it happens with cafes. 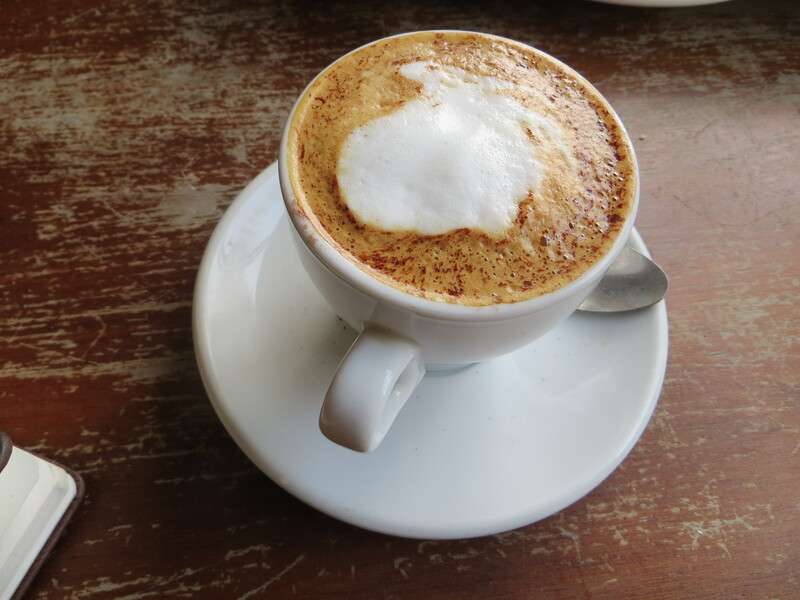 I don’t go from café to café looking for the cheapest Flat White or seeing which one is serving blueberry muffins (well, maybe I do). 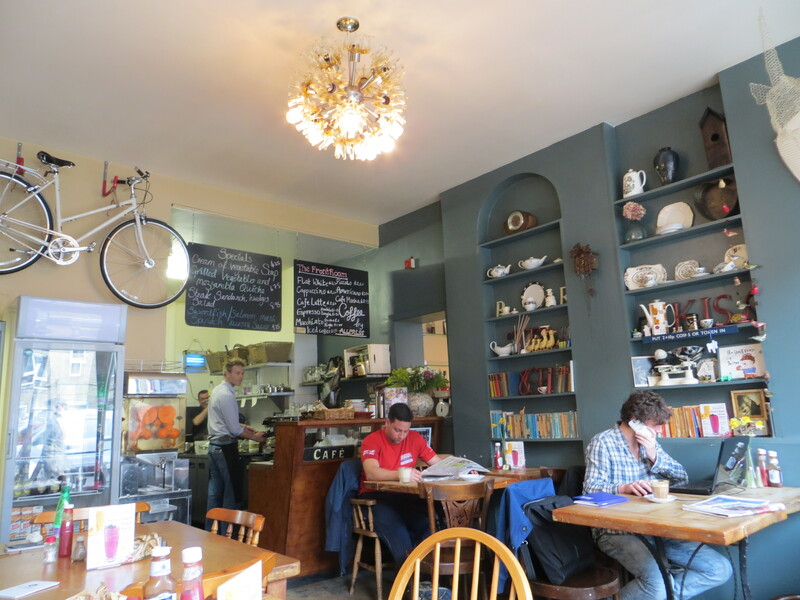 So, I find it odd that around a junction between Finsbury Park and Stroud Green, you now have the areas three best cafes all within walking distance of each other. 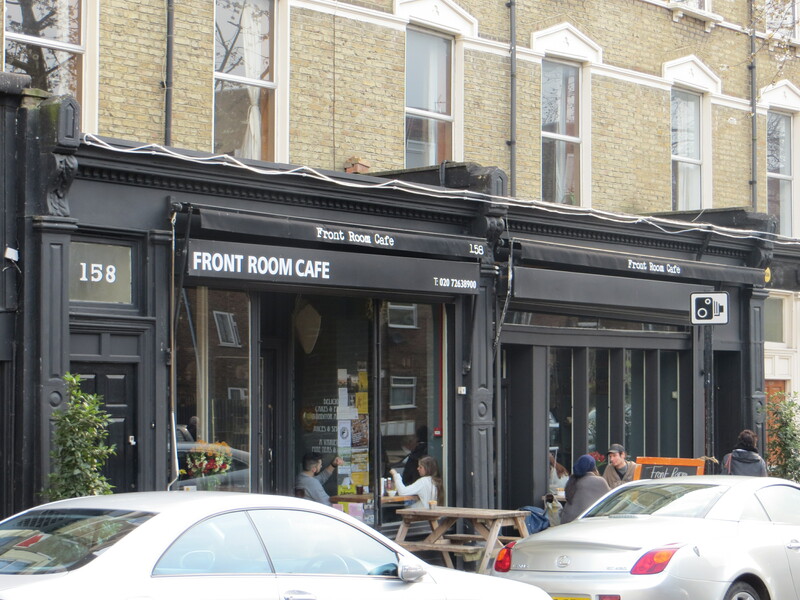 Across the junction from Vagabond, which I recently reviewed, are Boulangerie Bon Matin (owned by the people behind Sable D’or) and The Front Room, which I’m reviewing today. Super tasty cup of coffee from the Allpress roastery. Smooth tasting with a bit of a fruity after taste. However, the serving was a little small for my liking. Temperature and price were good though. It lives up to its name, though strictly speaking it should be Front Rooms, as it is split into two rooms joined by one large window across the front. It’s open, airy and bright while also manage to be cosy and comfortable. Books shelves are crammed with bits and bobs, a bike hangs on one wall and the seating is basic but comfy. There’s outside seating as well for the summer. All in all a great place to spend time. A great selection on the menu. Lots of choices and some tasty looking hot mains including sausage and mash and tagliatelle and meatballs. However, it loses a point because the choice of cakes and baked goods seemed pretty limited. Running a café is a fine balance when it comes to service between being friendly and being professional. Sadly, on this occasion the service was overly friendly – what I mean is that the one person serving seemed happier chatting to customers about all sorts instead of serving waiting customers. I stood waiting behind this little chat for some time. This alone wouldn’t be too much of an issue but when I did get served and sat down, the previous person’s dirty plate and glass remained on my table throughout my time there. Even when the staff were just stood around and I, very obviously, moved the plate and glass to the edge of my table. Poor stuff guys. Not a huge amount apart from the usual art for sale and a few other bits and bobs. There’s no website and the Twitter account isn’t updated much, so I’m presuming there’s no events. Again, a shame as they are based in a burgeoning community and it needs one of the local businesses to step up and bring the Tollington junction eateries and cafes together. It feels like they’ve set up an excellent café and think it’ll just run itself. What they’ve done they’ve got right – coffee, atmosphere and food are all great. It just needs that extra little bit of effort to keep it going and push it on further. Thanks for the positive review and have noted the negative service aspect and will slap some wrists and pull some socks up. We on the whole really care if customers are happy but on this occasion ( typical) it seems that too much attention was given to one and not enough to all.